Pipistel, the innovative Slovenian company that won the Green Flight Challenge with its G4 electric four-seater, continues to earn plaudits from the aviation industry. At this year’s AirVenture, the Experimental Aircraft Association’s annual gathering at Oshkosh, Wisconsin, the company was honored with the Dr. August Raspet Memorial Award and original and pace-setting design work exemplified in Pipistrel products. The Exerimental Aircraft Association has awarded the “Dr. August Raspet Memorial Award” annually since 1960 “to a person who has made outstanding advancements in the field of light aircraft design and the Experimental Aircraft Association.” John Thorp, Lockheed engineer and designer, was the first recipient, with those following including Curtiss Pitts, Burt Rutan, Alan and Dale Klapmeier and Gordon Pratt. 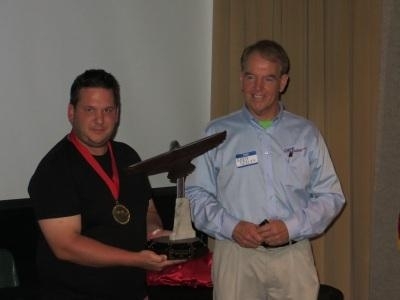 Michael Coates, Pipistrel’s USA distributor, accepted the award for Pipistrel. 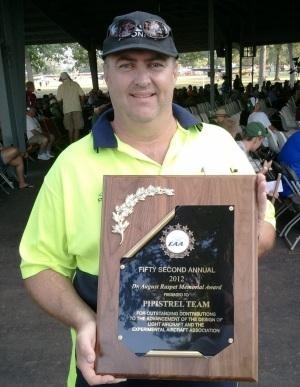 Michael had been a major player in helping Pipistrel get their GFC winner to Santa Rosa and the NASA competition. He also staged the presentation of Pipistrel and their products at the Oshkosh AirVenture expo. Taja explains, “The Personal Aircraft Design Academy (PADA) evolved from the Laminar Flow True Believers Society that meets at the Oshkosh AirShow every summer. The meeting of PADA during the Oshkosh AirVenture now includes an award ceremony for outstanding designers of personal aircraft who achieve state of the art progress in aircraft performance and efficiency.” This, of course, is a touchstone for the CAFE Foundation, and has resulted in the astonishing progress in aircraft efficiency we saw at the Green Flight Challenge. Tine Tomažič, univ.dipl.ing, and leader of the Taurus G4 development team won this year’s trophy. Any who have seen Tine’s presentation on designing and building the G4 in an incredibly short time are willing to acknowledge the worthiness of his receiving this honor. The 200-horsepower G4 was the most powerful electric airplane in the world from last year until Chip Yates rolled out his 258-horsepower Long-ESA in June this year. The G4’s lower-speed mission netted a fuel use equivalent of 403.5 passenger miles per gallon, about twice as economical as a Prius at twice the speed. That result, and those of the second place Stuttgart University e-Genius, stunned even NASA and CAFE personnel and marked a giant step forward in aeronautical efficiency. That same ability to craft efficiency into an airplane is evident in the two-seat Alpha Trainer, Pipistrel’s LSA which flew at Oshkosh. The 2.5 gallon-per-hour economy of the aircraft and its ready-for-electrification capabilities probably helped it garner its 10 fixed orders during the show, and shows the high efficiency which all future aircraft must aspire to as energy resources grow thin. Commercial considerations aside, Pipistrel had a very good Oskosh AirVenture this year.